Here at Pear Stairs, we sell every part and accessory you need to build a new staircase or repair and refurbish and old staircase. Handrails can be mounted on a wall as an alternative to balustrade handrails. 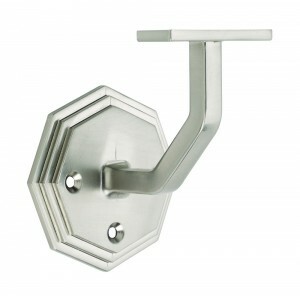 Brushed Nickel brackets will easily and securely fix a handrail to a wall. Brushed nickel is a common metal effect found on furnishings and other decorative household items and has a contemporary look. Brushed metal is metal with a unidirectional satin finish produced by polishing it so it has a dull polished appearance. Nickel finishes are slightly darker than chrome finishes in colour, giving them a warmer appearance. Some people consider the soft, satin appearance of brushed nickel more appealing than shiny chrome due to its subtlety. Handrail sections can be bought in a choice of lengths to fit your specifications. They can also be cut to length to suit. The wall mounted handrails we have can also be bought in a choice of softwoods and hardwoods, so you can match your existing stairs or home furniture. 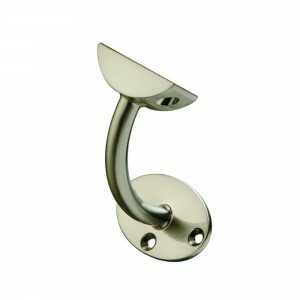 Adding a stylish bracket and endcap will finish the handrail perfectly.